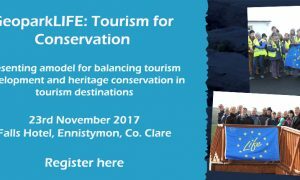 A model for sustainable tourism destination development that can be implemented by destination managers across the world will be unveiled at a major international conference at the Falls Hotel & Spa in Ennistymon, County Clare, on 23 November. The Burren & Cliffs of Moher UNESCO Global Geopark, which is hosting the ‘GeoparkLIFE: Tourism for Conservation’ conference, has produced a code of practice toolkit and a heritage sites and trails management model under its 5-year GeoparkLIFE conservation programme which concludes this December. The associated destination manager guides and supporting toolkits include an online code of practice in sustainable tourism for tourism businesses, a monitoring app for trails and heritage site management and an online data management tool for planners, managers and communities. These tools, developed in conjunction with local businesses, communities and conservation agencies, enable a balance between tourism development and the conservation needs of the North Clare region, according to the project coordinators. “Our GeoparkLIFE project was designed to explore how best to develop and manage sustainable tourism destinations of international conservation value,” explained Carol Gleeson, Manager of the Burren & Cliffs of Moher GeoparkLIFE programme. The theme of the ‘GeoparkLIFE: Tourism for Conservation’ conference, which coincides with the UN Year of Sustainable Tourism for Development, is balancing tourism development with heritage conservation in burgeoning tourism destinations. The keynote speakers include Prof. Gabriel Cooney (Professor Emeritus, UCD), Carol Gleeson (Manager, GeoparkLIFE), Tina O’Dwyer (Tourism Enterprises Coordinator, GeoparkLIFE) and Zena Hoctor (Sites and Monuments Coordinator, GeoparkLIFE). Travel Journalist and writer, Eoghan Corry will host a stakeholder panel featuring representatives of the agencies, businesses and communities that engaged with Geopark LIFE. The conference also will feature the launch of the Burren & Cliffs of Moher UNESCO Geopark section of the Heritage Council’s Heritage Map viewer programme, which allows users to find or identify heritage sites and explore heritage data sets anywhere in Ireland. The conference is the final event of the GeoparkLIFE programme 2013-17. The EU LIFE funded programme is supported by Clare County Council, Fáilte Ireland, Geological Survey of Ireland, Office of Public Works, Department of the Arts, Heritage and the Gaeltacht, The Heritage Council, NUI Galway and UCD. The Burren together with the Cliffs of Moher were awarded Global Geopark status in 2011 for their outstanding geological and cultural heritage and for the work being done in the region to develop a sustainable form of tourism. The Geopark was designated as a UNESCO site following a vote at the United Nations Educational Scientific and Cultural Organisation (UNESCO) General Conference in Paris in November 2015. The Burren & Cliffs of Moher UNESCO Global Geopark is responsible for the conservation and promotion of the area as a unique geological and sustainable tourism destination. It grew out of The Burren Connect Project, which was established by Clare County Council in 2007 to seek a collaborative balance between conservation and tourism interests. It was then and continues to be co-funded by the Geological Survey of Ireland and Fáilte Ireland, the national tourism development authority. In July 2012, €2.2million EU LIFE funding was awarded to the Geopark together with several agency and university partners for a 5 year ‘Tourism for Conservation’ programme. This funding will be used to support the Geopark’s Sustainable Destination Strategy 2013-2017 and the programme is known as GeoparkLIFE. The GeoparkLIFE project partners include: Clare County Council, Fáilte Ireland, Geological Survey of Ireland, Office of Public Works, National Parks and Wildlife Service, National Monuments Service, The Heritage Council, University College Dublin, NUI Galway, The Cliffs of Moher Visitor Experience and The Burren Ecotourism Network.